Buy Se'manaThompson a Coffee. ko-fi.com/mxsemee - Ko-fi ❤️ Where creators get paid by fans, with a 'Buy Me a Coffee' button. akimel otham artist. zine maker + collage art. curator of The People's Zine Library. 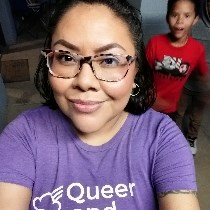 queer #AutisticAndNative #ADHDandNative #unschooling. Secured Payments. Support goes to Se'manaThompson's account. We have been invited to table at the Montreal Anarchist Bookfair on May 25-26, 2019. Decolonizing Parenting issue 2 will make its debut there! ••• The goal is to fund the cost of printing Decolonizing Parenting issue 1 & 2. ••• Buy 3 ko-fis ($9) to receive a copy of Decolonizing Parenting issue 2! Orders go out late May, early June. Upgrade Se'manaThompson to a yearly Gold Membership with a one-time payment.